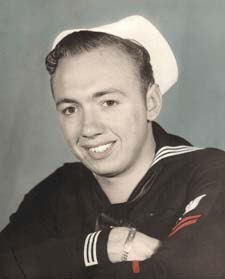 After high school, he entered the Navy, and was stationed in California when the Japanese attacked Pearl Harbor. He was immediately shipped out, and was there a few days after the attack. He served most of his time in the Navy aboard the USS Trever. When the war was over, he returned to Chicago. He had married my grandmother Emma, who also graduated from Waller, while on a brief leave. For a while, they lived in an apartment building owned by my great grandfather, and eventually ended up on Hermitage with their daughter. Mom graduated from Senn. If any of you readers were living in Uptown in the sixties and seventies, you may have seen my grandfather at Sears. He was the display manager at the Lawrence store, in the days when individual stores could decorate and arrange the displays as they saw fit. (Nowadays, all decorating decisions are handled at corporate headquarters. There's little creativity left in the job. ) He also worked the art fair circuit, specializing in a style of painting that looked like stained glass. If anyone out there has his work, signed Lon Dawson or Pennilon, I'd love to see a photo of it. My grandmother passed away in 1980. 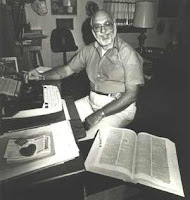 My grandfather remarried, and retired with his new wife to Southern Illinois, and there began a second career as a writer. In the 1990s, they sold their house and moved to the Veterans Home in Quincy. It was their last home. My grandfather died of cancer four years ago this coming January. I was very little when my grandfather lived in the neighborhood; my parents had taken me out to the suburbs when I was just under four years old, and I moved here five years ago. I don't remember much about his apartment, or the first house he bought. But I've heard enough stories over the years, so that there are certain places in Uptown that I can't walk past without thinking of him—particularly the Sears store. I know that a lot of us have lost our grandparents over the years, and some of us our parents. My grandfather was just an average guy, but he meant a lot to me, and I wanted to take a moment to share a few memories of him, and put a real face on some of the people who once called this neighborhood home. My grandfather had written a book chronicling his adventure during World War II about the USS Trever, which is now available through Amazon: Cradle Cruise. I actually have a Pennilon hanging in my basement. It's called "Afro Masks" It's kind a wood-cut, painting that resemble stained glass.